Solar startup Xtreme Energetics of Livermore, Calif., today said it signed a deal to license the technology behind making clear transistors from Hewlett-Packard. Xtreme Energetics CEO Colin Williams says the technology will enable the startup to make a more efficient solar panel that can convert up to 43 percent of the sun’s light into energy at a cost of $1.50 per watt, once then firm reaches 100MW production capacity. However, Williams says cost is only one factor in determining which solar panels a building owner should use. He argues that the Xtreme Energetic’s system will supply more of a building’s electricity needs with a smaller footprint using advanced materials and a solar concentrator. 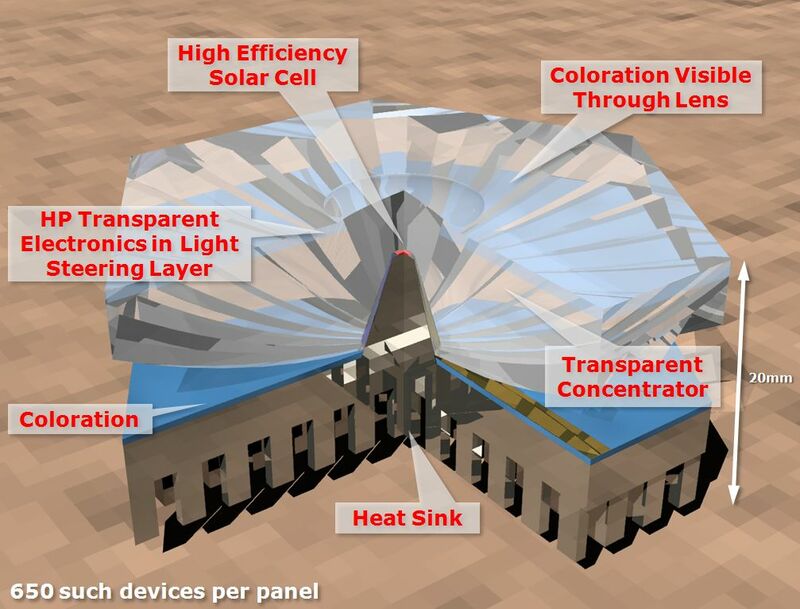 The planned system will contain a layer of panels made from unspecified polymers that are more efficient at converting the sun’s rays than silicon. On top of that layer will be a flat layer of HP’s clear transistors that follow and concentrate the sun’s rays onto the panels. The entire panel apparatus is clear and can be tinted to whatever color might match or compliment the building, meaning the days of obvious black silicon solar panels could end. Williams says the final system is two years from production. In the meantime, the startup is seeking about $5 million to build a prototype; in six months it will need another $35 million for manufacturing the clear transistors on a larger scale. The HP technology was designed for manufacturing clear electronic devices and displays, so should scale easily for solar manufacturing, said Dan Croft, director, IP licensing for HP. The clear transistor technology was developed in conjunction with Oregon State University. Croft declined to say how HP planned to use it in its own business, but said the firm tries hard to benefit from its R&D investments and is happy with the relationship it has with Oregon State. In two years perhaps architects will be happy with a more stylish solar panel. It would certainly be less conspicuous that some other concentrators in the works. This sounds great the future and survival of our plant lies in renewable energy and if this works as well as it appears it may be one of the many breakthroughs needs to save our mother earth. Agreed there is a lot of hype to raise money…and one does need to be careful, however, this instance isn’t one of those cases. Having been in solar since the 1970s I have seen lots of reinventing of the wheel these past few years. At best these “new” products are evolutionary as materials science has improved. In a few instances though, some thinking has produced revolutionary concepts. It is for this reason I became a principal in Xtreme Energetics and why HP is backing us with their technology. Certainly be careful when treading around solar technology or any other alternative energy claims….”vaporware” is out there and their will be some suffering as a result. Be careful. A lot of ‘hype’ to raise money.